This fall, Cronkite became the first pilot school of Google News Lab’s nascent News Lab University Network. So far, about 200 Cronkite students and faculty have been tutored by the lab’s training and development director Nick Whitaker. At Cronkite News, the digital production bureau test-drives all types of tools (including Google’s), from data viz to social media. Students in my Innovation Tools class review the latest apps and tools here on CronkiteLab.News so all students (and journalists) can hear about them. Staff and faculty have critiqued the Google News Lab web site, encouraging clustering modules into classes, and, sometime down the line, grouping classes into a certification program. “Students absolutely love trying new tools,” said professor Rebecca Blatt. “Exposing them to as many as possible seems to really open up new ways of thinking about reporting and storytelling.” New ways of thinking – the heart of innovation. We consider continuous change to be part of the “teaching hospital” model of journalism education. Just as doctors and medical students work together serving patients in teaching hospitals, master teachers and journalism students work as partners at Cronkite News, not just providing professional journalism to Arizona and the nation, but experimenting, innovating and engaging our community as they go. In other words, Cronkite News and Cronkite’s summer investigative program News21 reach millions of people with award-winning journalism — and at the same time we try the latest in digital tools and devices. Some journalism schools think their students can do either professional-level journalism, or test new ways to do it. Our students do both. For example, students on professor Jacquee Petchel’s Carnegie-Knight News21 team not only produced the widely recognized Voting Wars package, but their multimedia reports featured interactive graphics, targeted videos, even a game. That’s new. *Cronkite News has used Google tools in news reports from political conventions, on a virtual tour of an Aztec city, to track trends in voter registration and to map voting places and local park benches. Yes, even park benches! *The digital production bureau, led by Professor Blatt, has been using graphics programs Tableau and Infogr.am; Adobe Spark apps for social media; GroundSource for engagement; Banjo for social media tracking, Videolicious and WatchUp for video news. *This year the school experimented with its first big crowdfunding campaign, to increase our journalism on the border. Professors Angela Kocherga and Alfredo Corchado led the Borderlands bureau as it developed and reported on what we believe to be is the first poll in 15 years of sister cities on both sides of the U.S.-Mexico border. *Students working on audience engagement, led by Ethics and Excellence professor Jessica Pucci, is using parse.ly and HotJar to understand the Cronkite News traffic, mostly in real time, but also for weekly reports. They use CrowdTangle to track reporters’ Twitter and Facebook usage, and also have accounts with BuzzSumo, Hootsuite and Keyhole to better understand what’s resonating in social media. *We reached new audiences through experimenting with Cronkite News on Facebook. It’s a rapidly growing new audience, too, with an appetite for noon updates. I love it when the teleprompter text rolls in the corner of the newscast. Here’s the news. Here’s what the anchor is reading. Transparency! *The Digital Innovation and Entrepreneurship Lab, led by executive director Retha Hill, built an easy-to-use news game engine called Playable Stories. That’s what News21 used to create its voting suppression game. Students in professor Hill’s lab also won awards for their immersion video work. *Professor Brett Kurland’s sports bureau filed 360 video from the Rio Olympics and began to experiment with Facebook Live, streaming a show on Thursdays with the week’s top stories. What’s the point of all this? Simple. 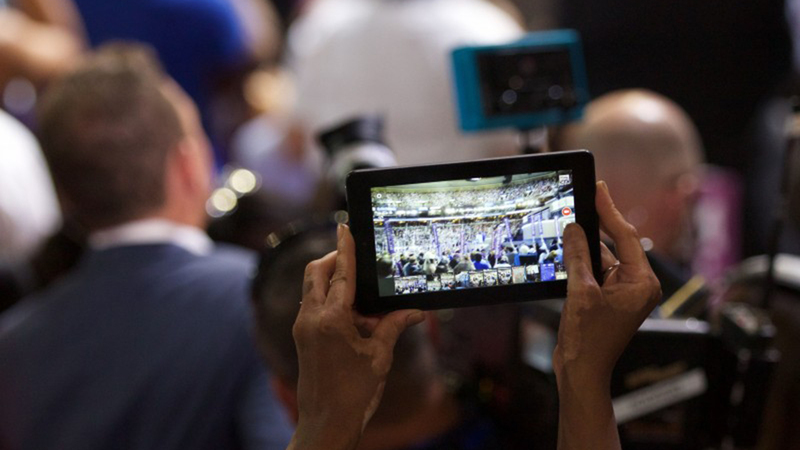 Journalists need all the help we can get — including new tools and techniques — to compete in the digital age, to bring greater context and broader meaning and reach to our stories. Slack was a big help on election day. Sharing stories, photos and videos was easy despite the number of polling locations. Cronkite News content director Heather Dunn said the newsroom could keep up with the long lines here in Arizona, and even field dispatches from New York, Washington and the border, by using Slack’s file-sharing function. The newsroom also learned new ways to train. The temptation is to train everyone up front, in, say, graphics programs, since you know they will eventually use graphics. But it turns out that just-in-time training can be more effective. When it’s time to create the graph, then teach that skill. For Cronkite, Fridays worked as “skill builder” days, with open-invitations to students to learn whatever skills were on the agenda. Not all new tools worked well. But others were game-changers. Such is the lot of innovation. Banjo (which we use for tracking social media posts by geolocation) flagged a cluster of posts about student walkouts at two local high schools on election day. We were able to send reporters to the protests, and one Cronkite student who had created a 360/VR startup got immersion video in short order. One of the most popular innovations has been the newsroom robot, Scotty. A Beam Pro virtual presence device marketed by Suitable Technologies, Scotty was a hit at Innovation Day in early 2016. We first used the robot for “innovation tours” — showing the leaders of the nation’s media innovation labs what we’re doing. As it turns out, Scotty has many uses. The robot helps not only guest speakers, but professors who might need to beam into classes. It assists with high school recruiting, remote meeting participation, and is a favorite at conferences. At Cronkite School, freshmen and sophomores usually don’t see the Cronkite News newsroom in full operation, but an entire class can visit using the robot. They truly enjoy it. Is Scotty, in fact, an “innovation”? The robot meets my test: a new method improving on the old. Sure, Skype will get you places, but you can’t look around while you are there. Facetime will beam you in, but you can’t control what you see or hear. The Beam unit is a new and improved way of being somewhere else. Even better, it’s fun. Beaming out now. See you next time.